A top Xiaomi executive has shared a poster on Weibo, which reveals that the Mi MIX 3 won’t be the only device launching on October 15. The Chinese company is also likely to announce the Mi Note 4 on the same day. 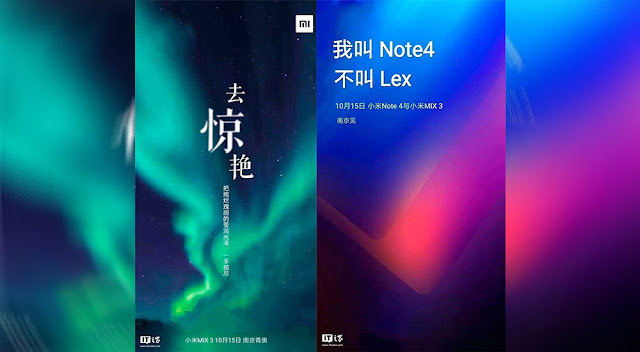 The teaser has the words – “Do not call LEX, my name is Mi Note 4.” This gives us an indication that Xiaomi is going to launch Mi Note 4 along with Mi MIX 3. The Mi MIX 3 photos have been shared by Xiaomi executives before, which showcase nearly invisible bezels around the display. Even the bottom bezels are almost nonexistent. This time, Xiaomi has included the selfie camera, earpiece, and sensors in the sliding frame. According to past leaks, the Xiaomi Mi MIX 3 will be equipped with a Qualcomm Snapdragon 845 chip, up to 8GB of RAM, wireless charging, and dual-camera setup at the back that includes a 20-megapixel primary sensor with support for optical image stabilization. As for the Xiaomi Mi Note 4, the device is expected to be powered by a Qualcomm Snapdragon 710 chipset. The device is also expected to boast a dedicated AI button, designed to launch Xiao AI voice assistant. Similar to Samsung’s Bixby button, the Xiao AI button too will be remappable for performing other tasks. Other rumored features include an in-display fingerprint sensor, and maybe a triple-camera setup at the back. This would make it the first Xiaomi device to come with such a highlight feature. Some reports also claim that Xiaomi could introduce a completely new lineup, called ‘Lex’. Any price and availability details are currently unknown. Just to remind, Xiaomi launched the Mi MIX as a prototype and later on it was officially launched in China for sale, at that time the design was revolutionary, but with time. The design of the device has gone outdated and this year Xiaomi Mi MIX is expected to launch with slider camera setup.